Last updated Tuesday, August 08, 2017. Below you will find a listing of historical (i.e. old) extant citterns and orpharions from museums and other collections. Clicking on the thumbnail image of the instrument will take you to a separate page of images for that instrument which may contain additional information. For related content, see also A Provisional List of 16th and early 17th Century Builders of Citterns, Orpharions & Bandoras and Peter Forrester's Provisional List of Extant 16th and Early 17th Century Citterns. Current location: Unknown. (Previously Museo Bardini, Florence, no. 152) Instrument came apart in floods of 1966. Instrument briefly analyzed by Stephen Gottlieb in 1974. A. Rossi 1530 or 1550? Urbino, Italy Current location unknown. In poor condition. Possesses some unusual fretting and fret labels. See page for more information. Not yet determined (maker's label present, but unreadable) circa1600, possibly English National Music Museum (formerly the Shrine to Music Museum) at the Univeristy of South Dakota, Vermillion, USA. Small, chromatic. Cittern auctioned at Christie's, April 2, 2007. Photos courtesy of Christie's via Andy Rutherford. See page for more information. anon. 16th/17th c.?, Dutch? These parts were recovered by from a sunken ship and represent one of only a few surviving Dutch instruments. See page for additional photos as well as pictures of a reconstruction by builder Sebastián Núñez. anon. 16th/17th c.?, Dutch? Brussels, KM 1524 Diatonic fretting. Photos courtesy of Peter Forrester. Girolamo Virchi 1574, Brescia Kunsthistorisches Museum Cittern built for the Archduke Ferdinand of Tyrol. The cittern head is a beautiful sculpture meant to portray the death of Lucretia. "Franciscus Citared. Urb." late 16th/early 17th c., Urbino? Current location unknown. This instrument was auctioned at Christie's of London, July 8, 1999. Gieronimo Campi / Canpi Italian, 17th c.? Museo Bardini, Florence 12c. "ceterone". Chromatic fretting. Imitates traditional carved construction. String length 68 cm and 123 cm. Photos courtesy of Stephen Gottlieb. John Rose 1580, England. Helmingham Hall, Suffolk, England.
? c. 1760, England Current location unknown. "English Guitar" (circa 1760) auctioned at Christie's, July 8, 1999. Forrester, Peter. "A Provisional List of Extant 16th and early 17th Century Citterns", supplement to Wood and Wire — A Lecture by Peter Forrester. Published in Lute News: The Lute Society Magazine (2005). Grijp, Louis Peter. "Fret Patterns of the Cittern." GSJ 34 (1981), pp.62-97. Also [in French] in Musique Ancienne 21 (1986), pp. 40-69. How to cite this page: Hartig, Andrew. 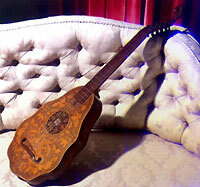 "Cittern Picture Gallery — Old Instruments" Renovata Cythara: The Renaissance Cittern Site. Ed. Andrew Hartig. 08 August 2017. 20 April 2019. <http://www.cittern.theaterofmusic.com/old/index.html>.